and i so liked your cleaning..i need to get this done ..
Oh then you are just like me :D I do the same...dump everything into the cupboard and hope and pray they disappear. Btw, I texted u today..no news..busy ho kya? :P :P...cartons and brown paper bags???? 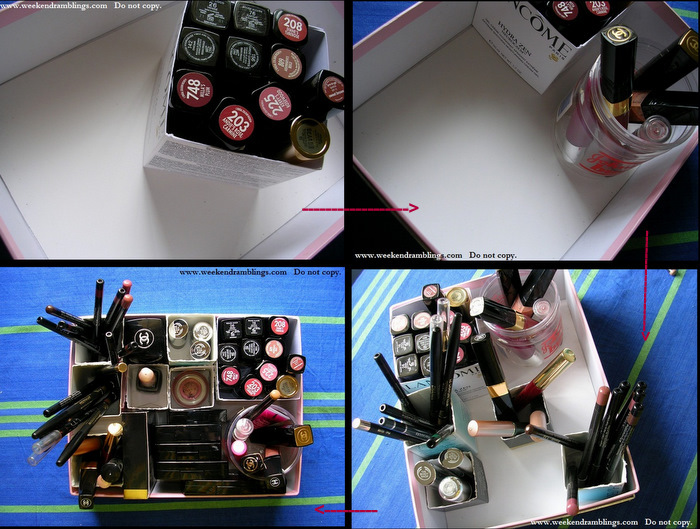 Aren't you the one with an amazing makeup cabinet...now I am confused..
Ohh and u found that E/s?? My sister & I love this phan lady.. We saw this video last year & did try out this paper bag trick - it totally works..
wow i didnt knew i am SMART .... i am blushing and grrrrrrrrrrrrrrrr i buy sensibILLYYYYY too yeah i said billy billy doesnt mean i am meaow ??? no modesty arnd na!! I dont have many chanels!!! smug smug!! I have many Loreals :D :D :D Wonder why nobody tries Loreal..everyone seems to love Maybelline. loved your post Rads, and everythings so neat and tidy..all my stuff is dumped in the cupboard out of Aidan's reach... I too have started carrying cloth bags to the groceries and anyways rather dump the skincare and cosmetics directly into my handbag. Heheheee...I asked and asked...nobody wanted it. Everyone thought its some chippad horrid trio. And now EVERYONE said its pretty...haaaa..next time when I say I want to give stuff away...you better contact me FAST. We never get any courier this late here..its usually all around 3ish.